Chances are high that unless you've been living on Mars for the past 2 decades (or your name is Steve Diggle), you know who Green Day are. However, what most casual GD listeners don't know is that their major label breakthrough "Dookie" is not their first album. In fact, it's actually their 3rd album, released after putting out 2 full lengths and 3 EPs on Lookout Records. 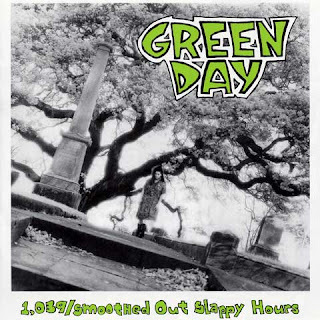 1,039 Smoothed Out Slappy Hours is a compilation, not to mention an amalgram in reference to the title, of their earliest batch of releases. Green Day, known as Sweet Children in their early days, were a product of the late 80's/early 90's East Bay punk scene; clearly influenced by older pop-based punk bands like Husker Du (especially apparent on their first EP), Buzzcocks, and Descendents, in addition to local favorites like Operation Ivy (whose song "Knowledge" is covered here), Crimpshrine, and Sweet Baby. The first thing many people introduced to the band through Dookie and beyond will notice is their heavier sound (mostly attributed to the lower production budget). Unless this is the first independently released album you've bought, it's not something that will surprise you too much. Also noticeable is the disparity in attitude concerning their later releases. Unlike the juvenile, snide, and often humorous themes found on Dookie, what you'll find here is a younger (obviously), more innocuous version of the band. There's nothing here that will strike you as particularly bold or rebellious, besides the rather vague reference to marijuana in their self-titled song. Instead, what you get is a collection of poppy punk (sorta) songs about love, insecurity, and a yearning desire to belong. The lyrics are adequate, yet simple and nothing really out of the ordinary. Basically, if you've ever read a diary written by a lovelorn teenage geek, you know what you're getting. The songwriting is where Green Day shines the most. Guitarist Billie Joe shows an early knack for writing infectious, melodic, and sometimes even beautiful melodies filled with exuberance, yearning, and angst. There's a couple of stinkers here, like Rest and the aforementioned Op. Ivy cover song "Knowledge", but songs like Going To Palasacqua (I have no idea what that means either) and Disappearing Boy are among the best punk-pop songs you'll ever hear. If you're already a fan, just getting into them for the first time, or even just a fan of pop-punk in general, you can't really go wrong here.